I finally had some time to do some testing with TSS shot. We all know it's some deadly stuff, but it has gotten so much hype, it's hard to separate fact from fantasy. I wanted to have some reasonably hard data points to look at. Before getting to the test results, also please note, this is a tiny data sampling here. It's as much as I can afford though . But, different gun, chokes, load, more shots, different test medium, the list goes on and on of how the results might change. I get it. This is just what I have, at this point, and it is what it is. So, take this for what it is, nothing more. Draw your own conclusions or form your own new questions. I tested just two TSS loads. Both 12 gauge 2-3/4”. Both 1-5/8 oz payload, listed by the data source at 1255 fps. One with TSS #4 and one with TSS #2. With 131 and 94 pellets each. All in my Benelli M2 with a 26” barrel. Let's start by looking at some patterns. Really terrible patterns. My first two patterns with TSS at 40 yards. Talk about a lousy start! Everything I had heard was to use less choke with TSS. So, the first choke I tried was an extended Carlson Mod. Horrible!!! Next, I tried a Kicks GT .670. 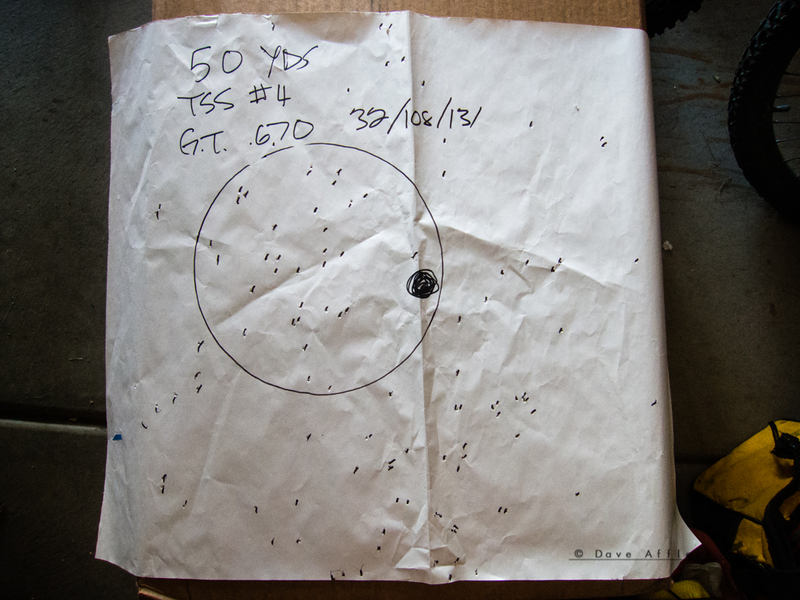 Kicks GT .670 at 40 yards – MUCH better! The #4, interestingly, had fewer hits in the 10” circle at 47. With a 131 pellet payload, I'd expect more hits in the 10”, not less. 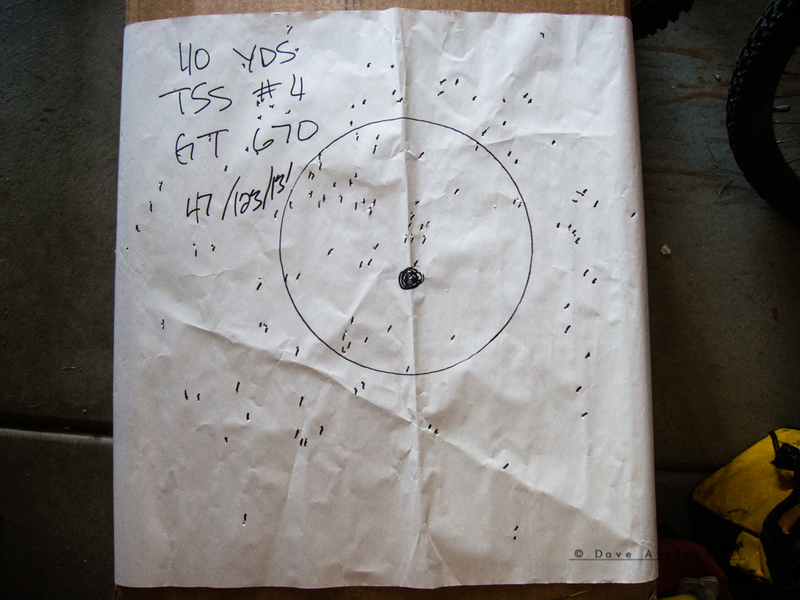 This proved to be the case in all patterns at all distances that I shot with the TSS #4 and Kicks GT .670 compared to the TSS #2, so I believe a better choke could be found for the #4's. But, that's a fairly even and dense pattern over the whole 2x2 backer, with 123 out of the 131 pellets in the shell hitting that two foot square. And 47 in the 10” at 40 yards, that's a coyote whose soul is halfway to heaven before it has any chance to hear the shot. So, while I think a better choke could be found, that's still a coyote killer of a load and pattern! And, it must be stressed, I have done quite a bit of patterning with this shotgun in the last few months since I got it. With more than a half dozen 3” loads and many chokes. All geared 100% towards coyote. 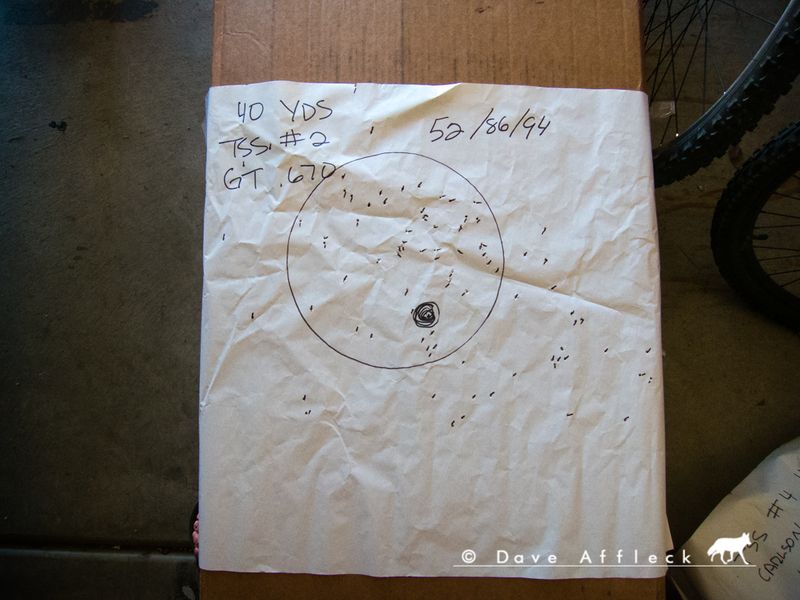 These first two shots at 40 yards with 2-3/4” TSS loads and the GT .670 are by far, the best 40 yard patterns I've seen yet with this gun yet. For comparison, these are the two next best I've seen at 40 yards so far and it took a lot of shooting to come up with them. Dead Coyote T, with DC choke, 34 in the 10”, all 51 pellets in the shell hit the backer. Nickel Plated F, 1-3/4 oz, 26 of the 49 in 10”. 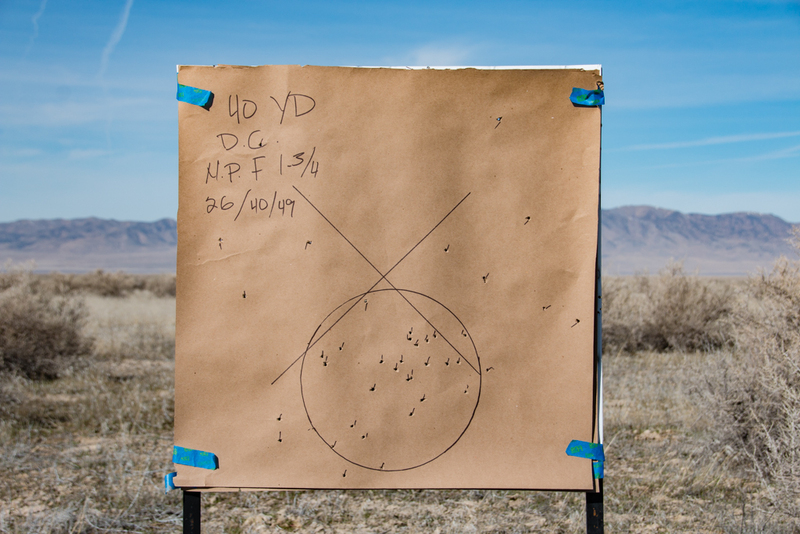 At 40 yards, the TSS #2 is putting TWICE as many in the 10” as my previous best handload, the NP F.
That, is some seriously good 40 yard patterning, I think. The TSS #2 put 37 in the 10”, 71 on the backer. The TSS #4 put 32 in the 10” and 108 on the backer. Again, with the #2's putting more in the 10”, I think the #4's are wanting a different choke. But, still, pretty dang good! Nothing else I've patterned at 50 yards has come anywhere close to that kind of hit density in the 10”. That, is some seriously good 50 yard patterning! This TSS is looking awfully good, so far. So, let's look at 60 yards, why not, eh? I only took one shot at 60 with the TSS, using the #2's. I also shot 3” Dead Coyote T and 3”, 1-3/4 oz of nickel plated F at 60. Here all all three patterns. As you can see in the pictures, TSS #2 was the 60 yard pattern champ by a mile. Putting a whopping 25 pellets in the 10” circle, at 60 yards. And still, 72 hits on the two foot backer – that's as many pellets as are in my Hev-shot BB 1-1/2 oz load. But TSS #2 penetrates WAY better than HS BB. So... 70 yards was never a goal for me here, just not even part of the plan. But, after looking at the 60 yard patter from TSS #2 for awhile, I couldn't help but wonder, could it actually hold a coyote killing pattern still at 70 yards? It sure looked like it might. 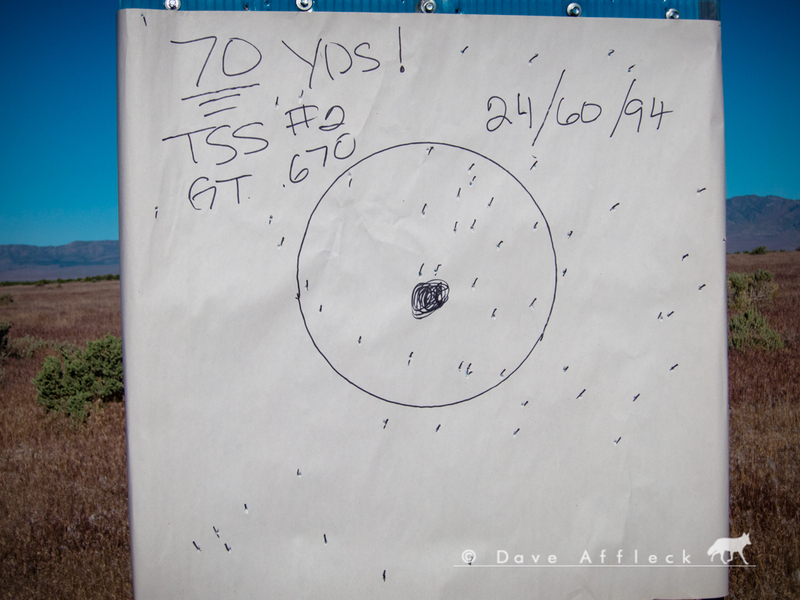 So, a week later, I went back out and took one pattern shot at 70 yards, using TSS #2. Here's the setup. 70 yards is a loooong way out there, for a shotgun. And here is the pattern. At 70. Freaking. Yards. That 70 yard pattern, is nothing short of astonishing to me. That would be a dang fine looking 40 yard pattern for most coyote loads in most guns. We'll get to penetration in just a moment, but suffice to say, all indications are that TSS #2 is going to penetrate better than anything else I've ever used for coyote. At this point, I believe it will have sufficient penetration at 70 for good coyote killing performance, though, only field experience will truly tell that tale. But that pattern right there, at 70 yards, sure looks to me like a facing or broadside coyote is going to hit the dirt and not get back up. For myself, this is redefining what I think of as “possible” with a shotgun for coyote. So here are some tables and charts relating to my pattern testing with coyote ammo in this Benelli M2 the last couple months. Note – I finished these tables and charts before doing the 70 yard pattern, so it's not included in any of them. And that 70 yarder was way better than could have been predicted by previous results at 60 yards. Again, tiny sample size, makes for lumpy data, but it's all I have at this point. 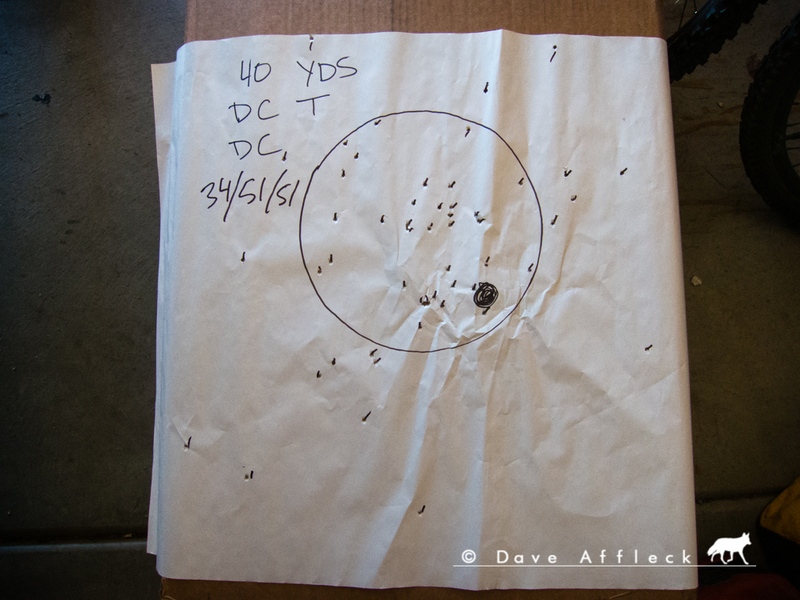 Here are the results of considerable pattern testing at 40, 50 and 60 yards in table format – note, most of these loads were tested with multiple shots each with at least a few chokes and these results represent the best of each not the average. 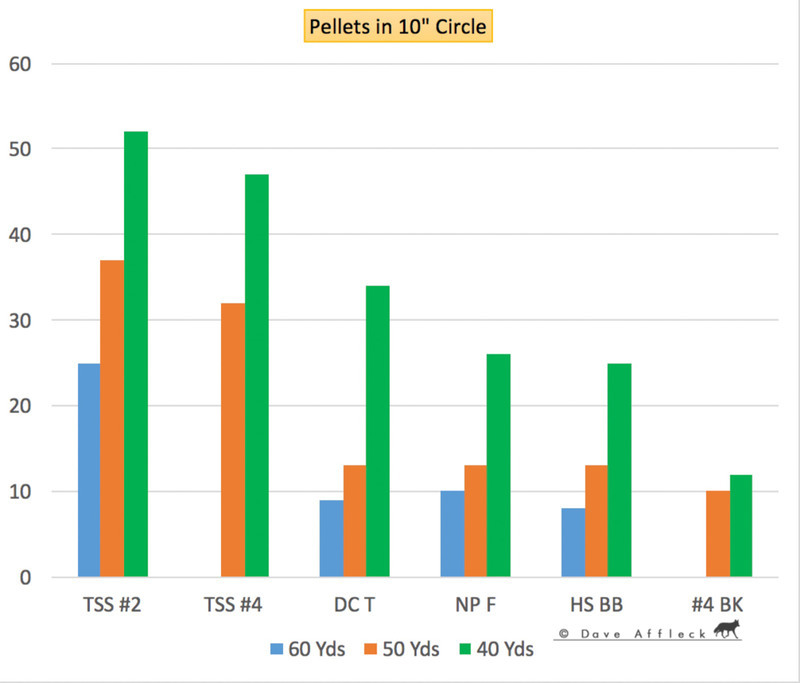 And here is some of the same data in chart format, showing the number of pellets that hit in the 10” circle at different distances for the same group of loads. 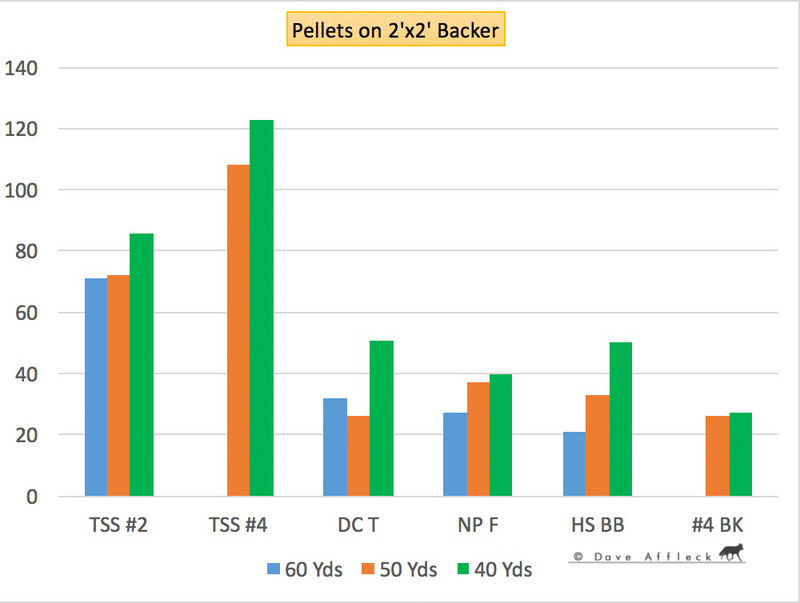 And another chart showing how many pellets hit the 2'x2' backer paper for the same group of tests. 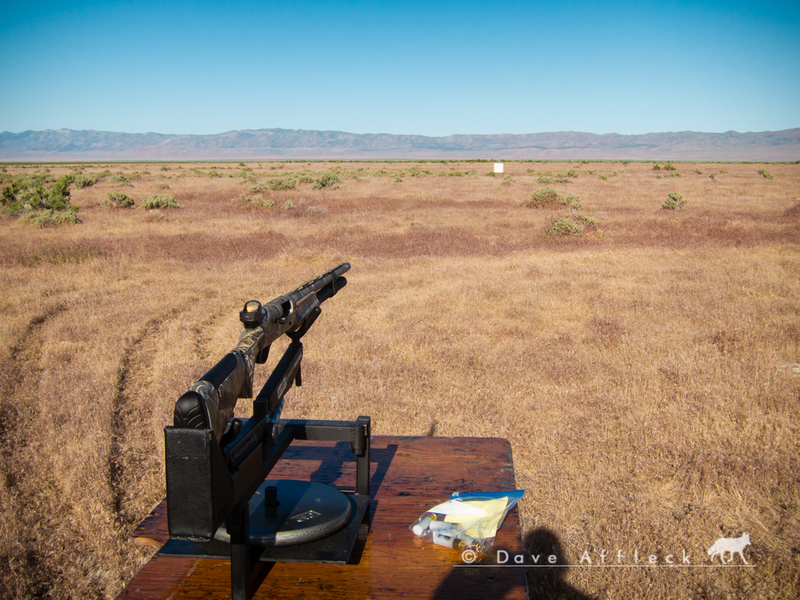 An indication of overall pattern size and density, which shouldn't be ignored – I'm not interested in turning my shotgun into a rifle here, being able to make hits on close in, fast running coyotes flying through the sage brush is my primary use and interest for the shotgun. Bottom line on pattern testing, TSS patterns better than anything I have ever tried. 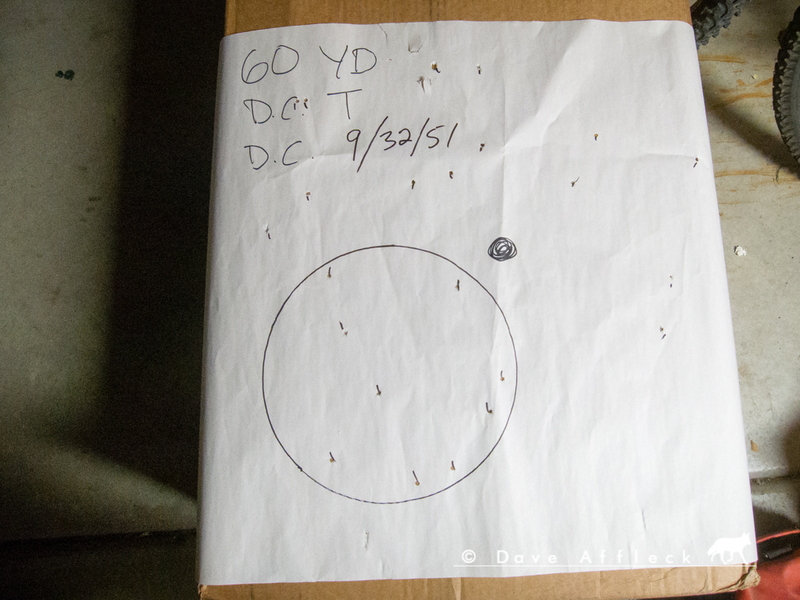 - Excluding TSS, the previous three way tie for most pellets in 10" at 50 yards was only 13. 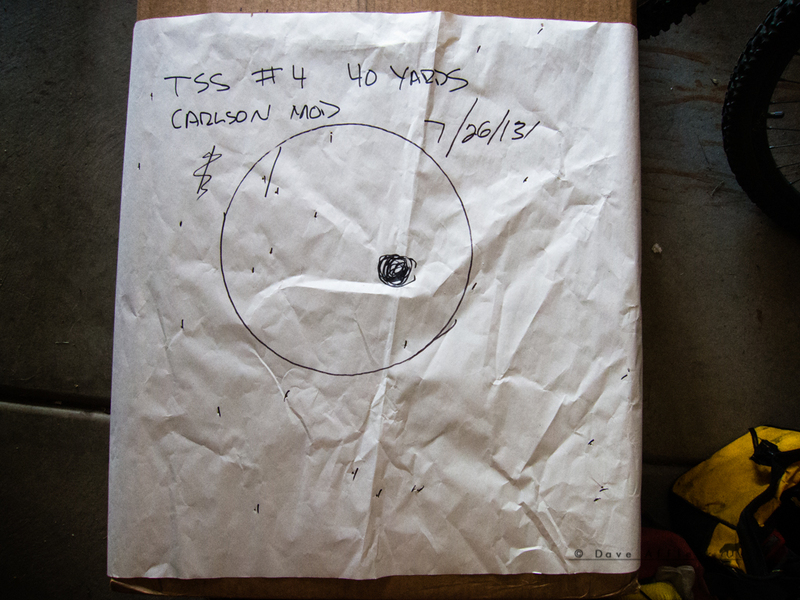 The 37 in the 10" at 50 yards for TSS #2 is almost three times as many hits as previously seen with this gun. - My Hevi-shot BB load, with 72 pellets total and 25 pellets in the 10" at 40 yards, has proven a good coyote killer for me out to about 45 yards. 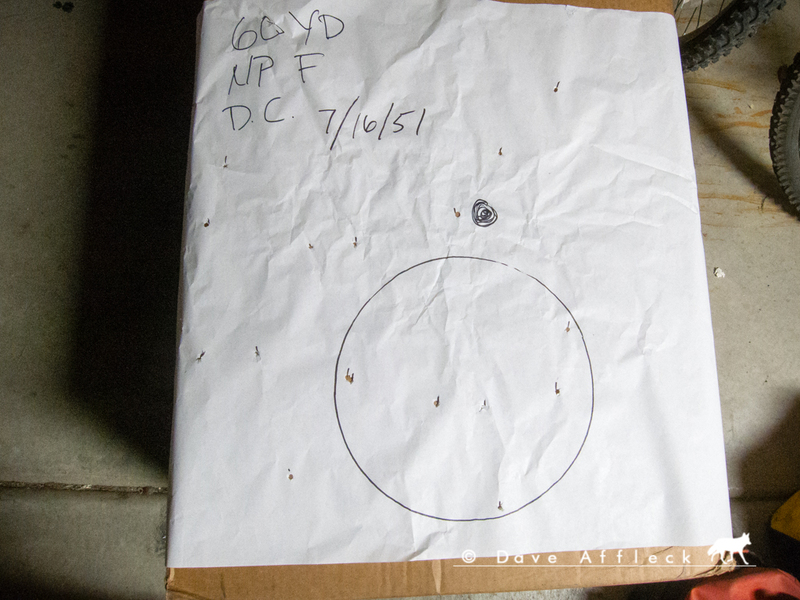 TSS #2, with 94 pellets total, puts the same 25 pellets in the 10", at 60 yards, with much better penetration! - TSS #4, with 123 hits on the 2'x2' paper at 40 yards and 32 hits in the 10" at 50 yards, with overall better penetration than Hevi-shot BB, is going to be just a big, dense, nasty swarm of death out to 50 yards. - Dead Coyote T is a well proven effective coyote load. But TSS #2 just beats the heck out of DC in every test. Patterns and penetration with TSS #2 are just far superior to Dead Coyote T. It's not even close! Okay, so how about penetration? I use predicted ballistic gel penetration in KYP shotgun ballistic software as my basic benchmark. Based on his considerable experience with shotgunning coyote, using heavier than lead shot and working with the KYP program, derbyacresbob has suggested 3.7” of gel penetration as the minimum for good killing penetration on coyote. These are the distances where 3.7” of penetration is predicted by KYP (as adjusted for my typical conditions). You can draw your own conclusions about the usefulness of these penetration predictions. But, clearly, TSS #2 is predicted to maintain penetration at further distance than any of the others. That, combined with the patterning shown above, could make for some might fine performing coyote ammo! 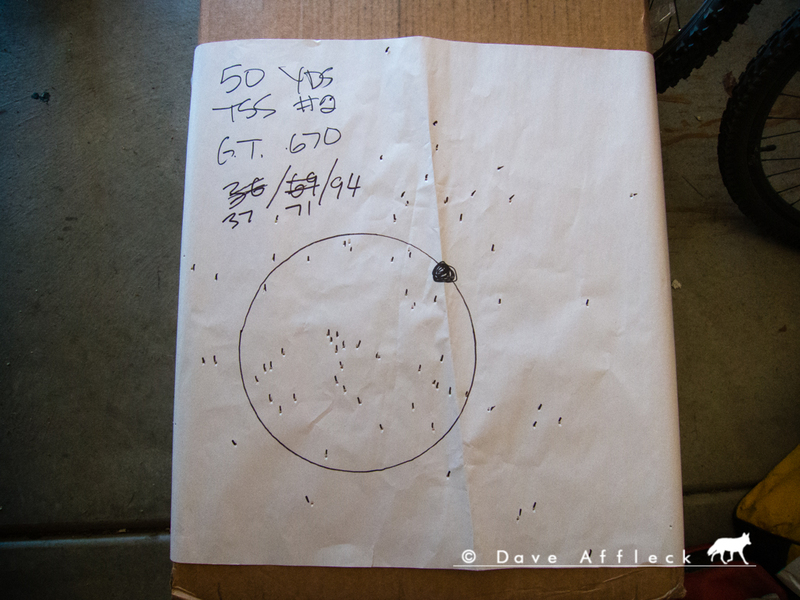 While shooting patterns at 50 and 60 yards, I was also shooting into phone books. 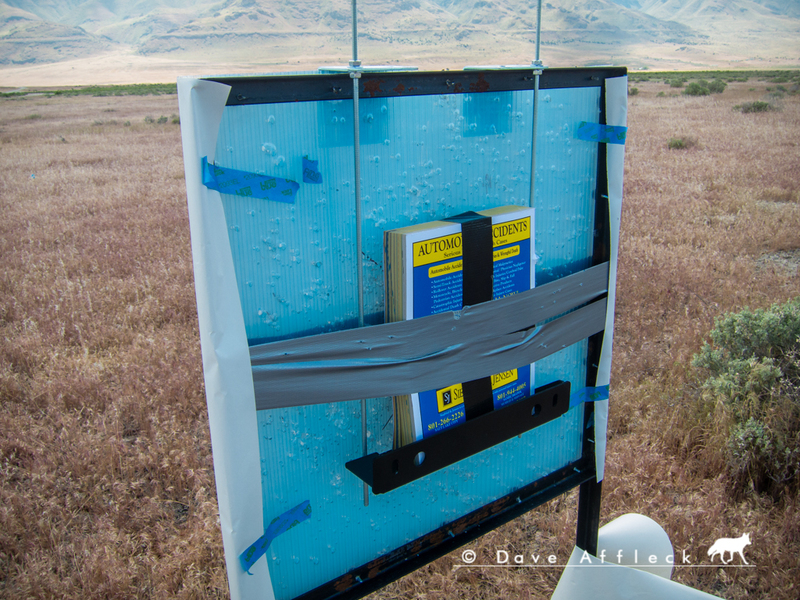 I taped the phone books closed and rigged a little holder out of crap off my junk pile and used duct tape to hold them tight against the rear of my target stand/backer. After the shooting was done, I carefully opened the pages of each phone book and recorded how many pages deep each pellet I found had made it. 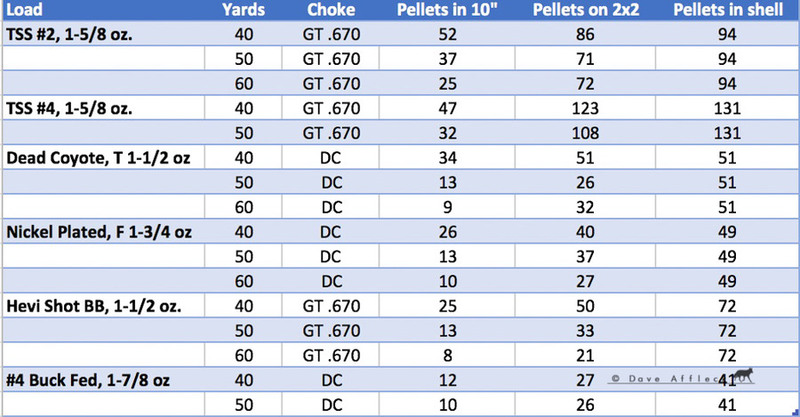 Here is the table of the 50 yard data, showing shot type, the page number of each pellet found, total count of pellets found, total number of pages penetrated by all pellets and the average number of pages penetrated for each shot type. 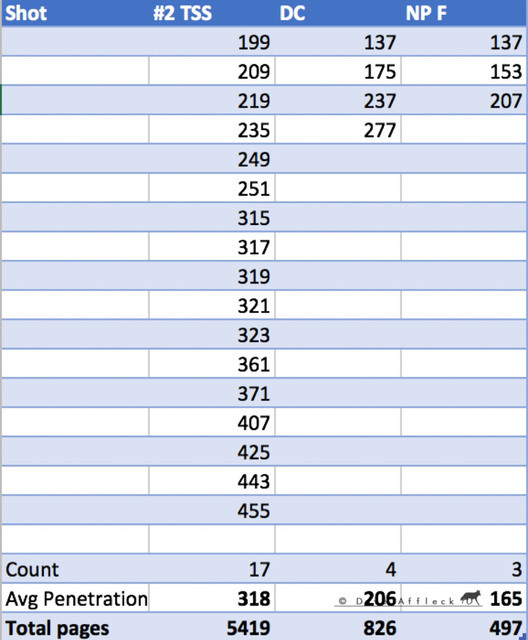 Here is a chart, showing the count and the average number of pages penetrated for each shot type at 50 yards. As you can see in the figures above, the phone book test did not shake out in exactly the order predicted by KYP. Phone books aren't ballistic gel, I guess. And for dang sure neither ballistic gel nor a phone book is a coyote. Taking it altogether though, I think it looks safe to say that the TSS #2 is going to penetrate coyote very well at shotgun ranges. 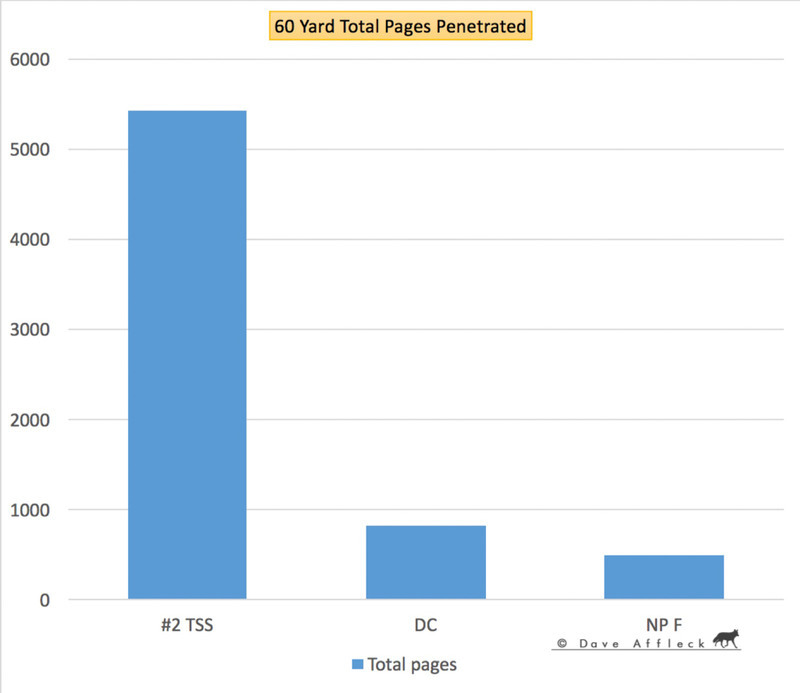 It took second place for average number of pages penetration at 448, vs 555 pages for the winner nickel plated F.
But what I find truly remarkable about this comparison, is that I HIT the dang phone book with 24 pellets of TSS #2 at 50 yards! And 16 times with TSS #4. Vs. hitting it 8 times with Dead Coyote, only 6 pellets each with #4 Buck and NP F. I think that TSS #2 load is just going to crush a well hit coyote at 50. 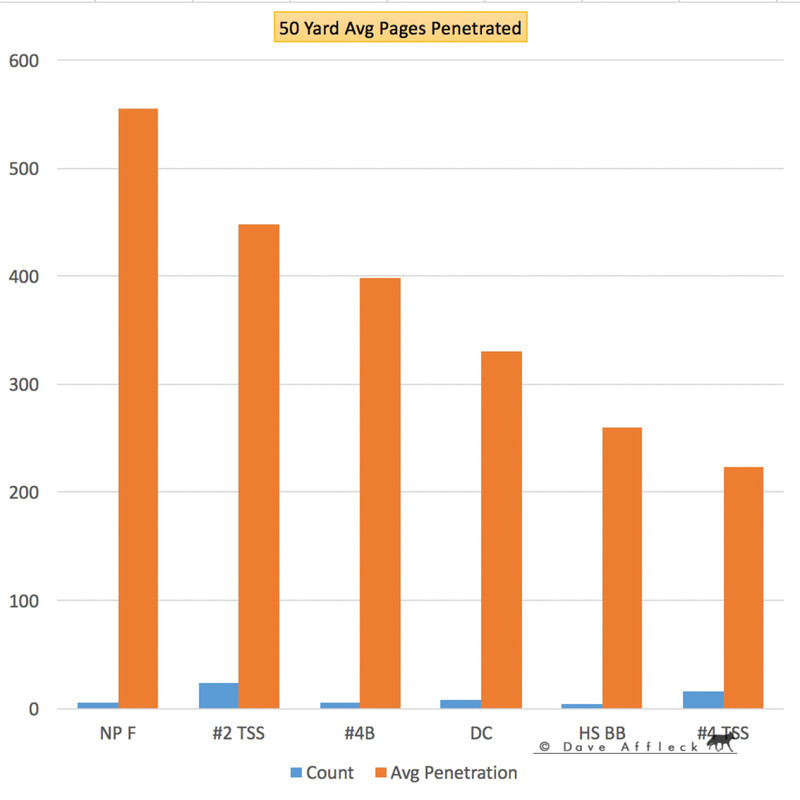 To illustrate the number of hits and the implications, here is a simple chart showing the total number of pages penetrated for each shot type at 50 yards. You might think of this along the lines of “total distance of wound channel inflicted”. 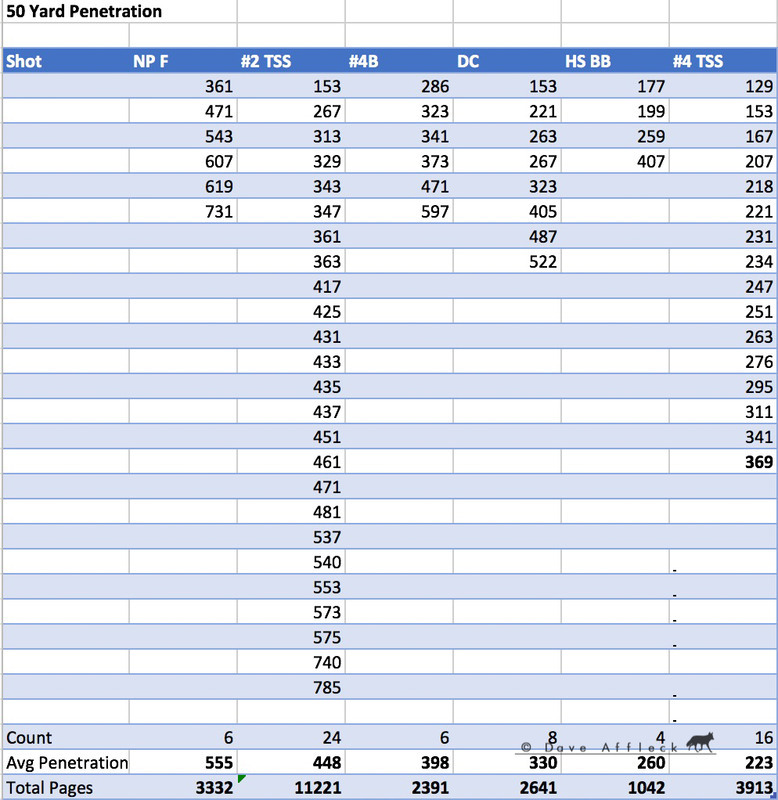 Note the TSS #4, came in last for average penetration. But, it's pretty close to HS BB, which I've found a reliable killer out to 45 yards. 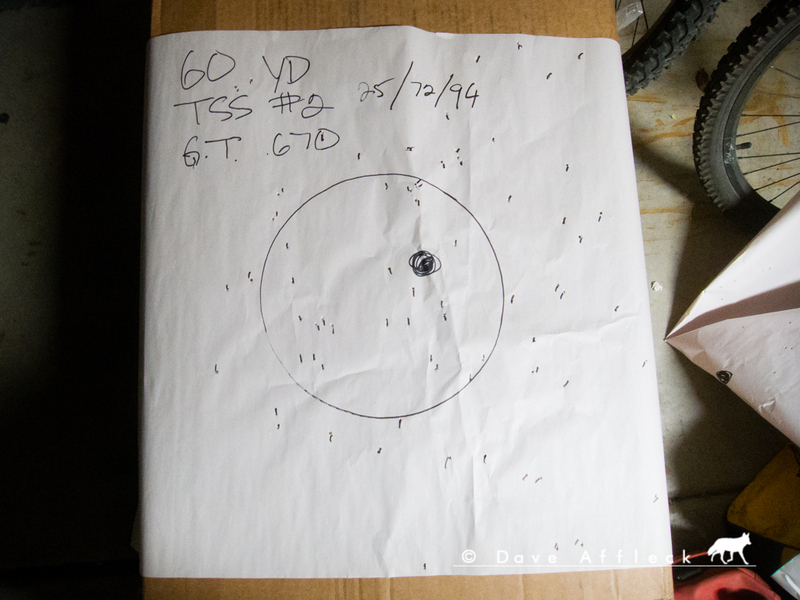 The difference, the HUGE difference, is that 16 of the TSS #4 pellets hit the phone book at 50 yards while only 4 of the HS BB pellets did. 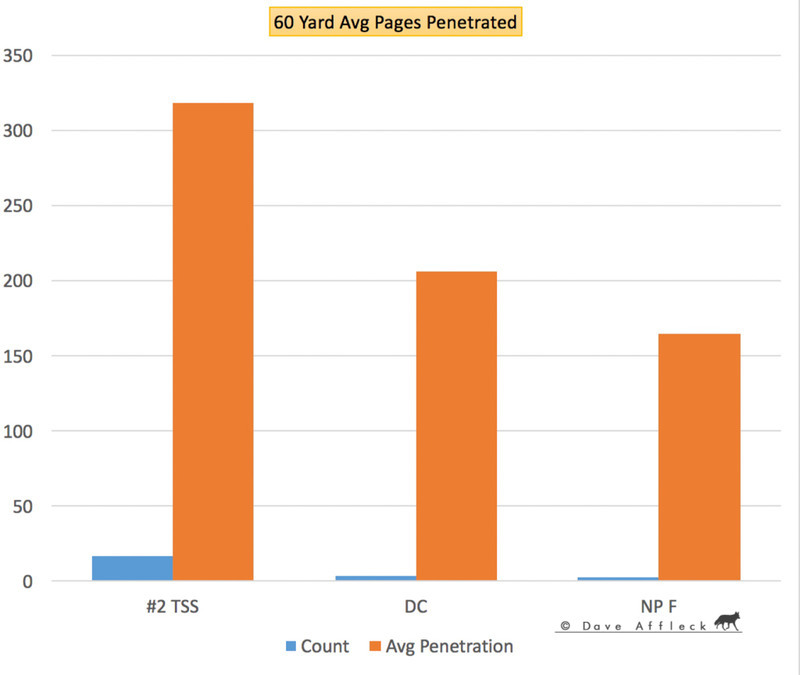 Putting TSS #4 in second place for total pages penetrated, behind only TSS #2. And here is a picture of some of the shot recovered from the 50 yard phone book. Note, the TSS looks reusable and I have in fact, reused it! Note that some of the Dead Coyote shattered. And the deepest penetrating Dead Coyote pellets were the ones that remained whole. Now let's look at the 60 yard penetration test. I only took three shots at 60 yards, here is the data in table format. Very interesting! 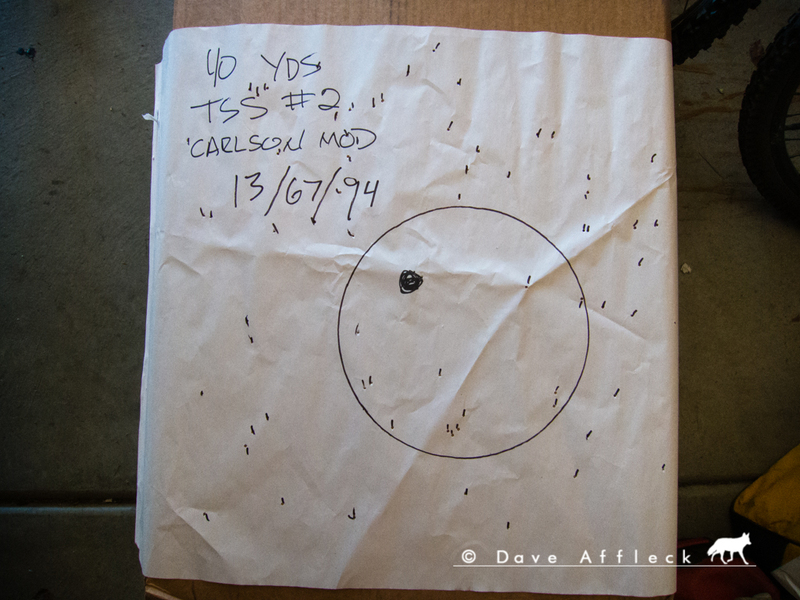 TSS #2 came in second place for average penetration at 50 yards, but pulled WAY ahead by 60 yards. Again, phone books, not gel, not coyote, but, still! And again, while the raw penetration is very impressive – going up against Dead Coyote and NP F, it came out on top by a wide margin. 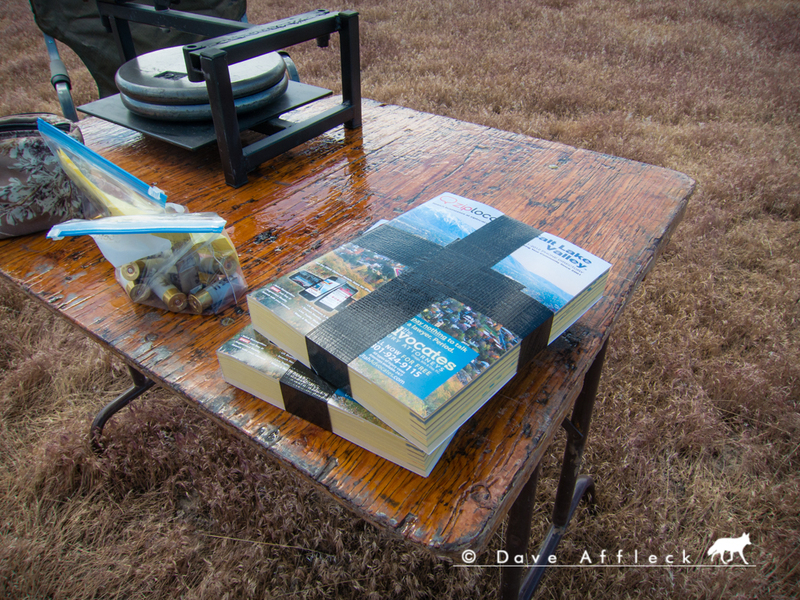 But, what is truly awe inspiring, by comparison, is that the TSS #2 hit the 8.25”x10.75” phone book 17 times at 60 yards! Vs. only 4 hits for second place Dead Coyote. Here is the total pages penetrated chart. Thinking about it in terms of representing tissue disruption, TSS #2 is just killing it here. Lastly, some of the shot recovered from the 60 yard phone book. 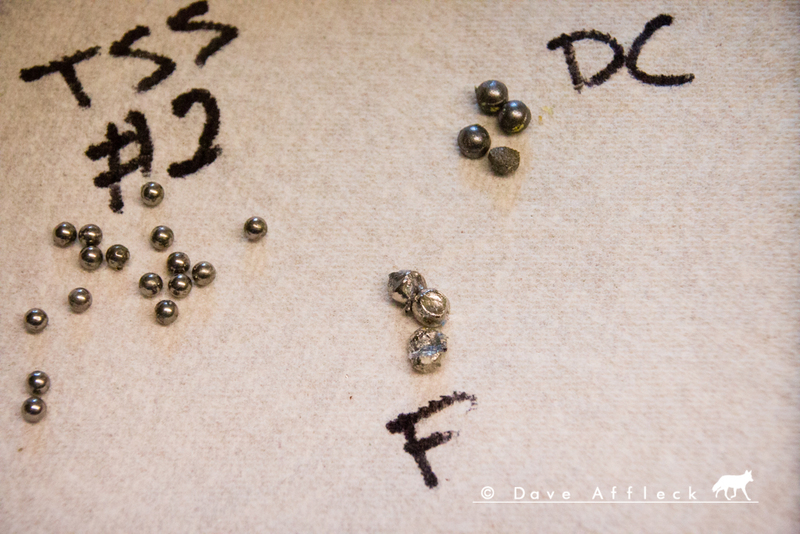 Note, the TSS shot is much, much harder than lead, I can barely put a mark on a pellet with pliers. I know which load I want to be using on a longish shot. And it ain't even close. That, is some impressive test performance Gentlemen! Only field experience will tell, but I do believe this TSS #2 load will be a reliable clean killer at 60 yards. And the TSS #4 ought to just hose them down out to 50. It will be a few more months before I get out amongst 'em and unleash these loads on coyote. I'll report back after I've killed a couple dozen and performed a few necropsies. I'm expecting to be impressed. Finally... If you have made it to the end here, I thank you! The resources I put into this aren't trivial so I really do appreciate that you've taken the time to read it all. I hope you've found this interesting, if not outright useful. Wow! What's it cost you to load one of your #2 shells? With all those charts, the only one missing is cost per unit. Well put together, lots of great data. I have been out of the shotgun world for about 15 years. What is TSS? this read reminded me of when I got my 1st 3 1/2 in Remington for turkey hunting the bigger chock tube opening the better patterns were I think the biggest opening I found was .680 ? Well... Cost seems to dominate a lot of TSS discussion. I'm sick of it and frankly, am going to puke if this turns into another thread about the cost of TSS. I was exploring performance and deliberately chose not to talk about the cost end. But... I confess. The cost chart exists. It's the first tab on my spreadsheet. I made it long before I even ordered any TSS . And I knew it was going to be one of the first things brought up, whether I wanted to talk about it or not. Like I said, it seems to dominate TSS discussion. But to answer your question, these cost me just over $5 each to load. The same price I paid for the Dead Coyote factory ammo. The NP F load would get the value award at $1 each give or take two cents. The HS BB load is another great bang for the buck, they cost me about $1.40 each (great prices were had on all the components). TSS - Tungsten Super Shot. Much denser than lead at 18gr./cc and much harder too. Wow, Dave, thanks for putting forth all that effort and expense. I got a new semi-auto to use this coming season. Haven't tried a shotgun much before, but have a friend who shoots about 40% of his coyote with one. Now, since you won't need it anymore, can I have your 17 Predator? I haven't shot coyote with a shotgun before, but probably should carry one. I also don't reload for my shotgun, but appreciate this kind of info and understand the work it takes to put it all together. Of course cost drives the discussion, whether it should or not. Many of us shouldn't really be worried about cost per shell because we don't even see a third of the coyotes in a year that you seem to put down. Our total cost isn't really that high. But as in all things, we just can't get it out of our heads. It's the same reason people hunt or carry fmj or some other cheapo round in their carry pistol. It makes absolutely no sense, and doesn't save most people very much money. Still it's hard for us all to practice what we preach when it comes out of our own pocket. wow. been waiting for this. impressive testing and results. thanks for doing it and sharing it. that was all 2.75 shells. going to try some 3 inchers? if you shoot a 223 at coyotes you may father children with 6 toes. are you willing to chance that? TSS shot is about 45% denser than lead so the same weight of TSS shot takes up much less space as lead or even Hevi-Shot. 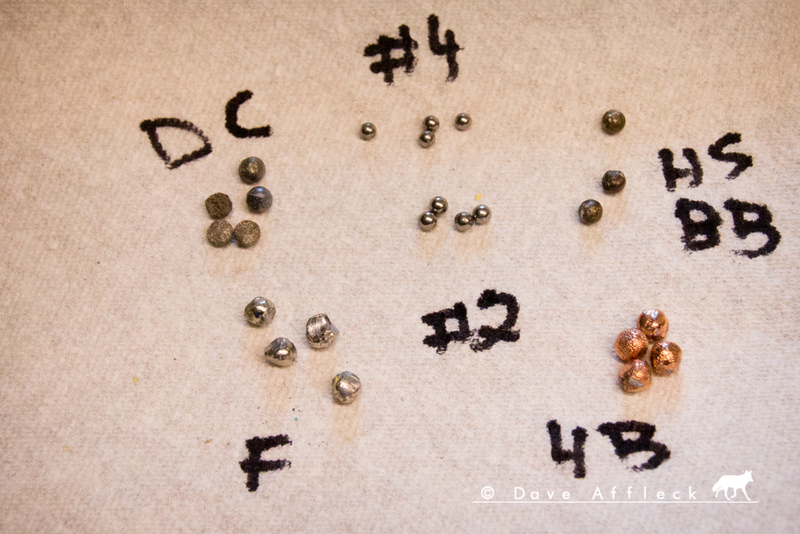 Dave's 2-3/4" reloads have 1-5/8 oz of TSS shot in them and most of the factory lead and Hevi-Shot 3" coyote loads have 1-1/2 oz of shot in them. So there is no real need to go to 3" loads. For the guys that have to use Lead Free shot on coyotes or can't legally use buckshot on coyotes TSS shot may be the best way to go. You can reload the TSS coyote loads for the same amount of money it takes to buy factory Hevi-Shot Dead Coyote loads but the TSS loads out perform the factory Hevi-Shot loads by a long ways. Now to try and find TSS as cheap as we possibly can! Amazing performance to say the least. Z, you'll have to fight Tim for the .17P . Slick - what Bob said on the 3". Had been my plan, to use 3", but simply no reason to unless I want to get crazy with the payload. At this point, I see no reason to go heavier with it though. The test performance of the #2's especially, just blows me away. Keith, I'm too broke to move on it anytime soon, but next year I'd very seriously like to get a group buy put together where some of us go in on 100 kilos from China. This is good info DAA, thanks for all the effort put into your test. I was doubted and talked down to when I first came on here and posted about TSS, but it appears now that the proof is in the pudding.If you want to know more, shoot me a pm or email me at blingslinger2017@gmail.com, and we can discuss TSS.